The whole process went well. We were able to pay more toward Vehicle 1, which is going to help us pay it off faster. We hope to keep doubling our payments, and pay it off eight months early. We kept to the cash envelopes and did not accumulate any new debt. Overall, it was a terrific month!! We are doing so well now and we really don't face any challenges any more. We know what we need to do and we just stick with the plan. What is your favorite tool on JosephSangl.com? I like the blogs. It is nice to see how other couples are doing on the Debt Freedom program, as well as hear feedback from the readers. Couple #2 has been after their debt for just eight months, but look at how much they have gained! They have cut their "Months Until Debt Freedom" by nearly fourteen months! They have paid off $18,000 in debt! They could have used that money to go on some serious vacations, buy a new vehicle, or other fun item, but they have chosen to live this way for just a little while so that they can break the cycle of debt. Think about what life will be looking like for Couple #2 in just a short time when they achieve debt freedom! They will free up $1,775 in monthly payments. That is TAKE-HOME pay! How much money does one have to earn to take home $1,775? About $2,500! So, Couple #2 is going to be able to give themselves the equivalent of a $30,000/year raise. WOW! If you dumped all of your debt (and its associated debt payments), how much of a raise could you give yourself? Start your own Debt Freedom March by visiting the FREE "TOOLS" page and by obtaining a copy of I Was Broke. Now I'm Not on AMAZON.COM, BORDERS.COM, or via PAYPAL. 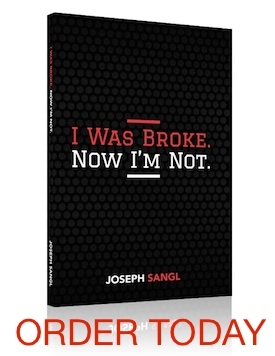 This book tells my story AND teaches the practical tools that my family used to win with money. You can too! There are people like me out here cheering you on even if I don’t normally comment! KEEP IT UP! Keep marching on man. Thanks for sharing your own debt freedom story. I’m consumer debt free and there’s nothing like it. Freedom!